What do you get when you cross a bunch of angry losers with a cowardly mayor? Antifa and Black Lives Matter protesters in Portland bully an elderly motorist, verbally attack a senior citizen in a wheelchair and disrupt traffic during a weekend demonstration caught in a series of stunning videos -- that also show no police presence as the chaos unfolds. The group of more than 100 people initially began marching through the streets of the Oregon city Saturday to protest the death of Patrick Kimmons, who was fatally shot by police Sept. 30 after a gunfight that left two men wounded at a parking lot near Southwest Third Avenue. But soon, videos show some members of the group verbally harassing passersby and drivers, and other demonstrators attempting to direct and disrupt traffic. In one video taken by Portland-based videographer Brandon Farley, the self-appointed traffic cops are heard telling drivers to go around the protesters. Most drivers turn away, however, at least one person objects to changing his route and asks why he should. A man then walks into view yelling profanities at the driver, and, soon, others join in. “Go back to North Carolina! We don’t need your KKK,” one person yells, apparently referencing the man&apos;s license plate and connecting him to racism because he lives in one of the Carolinas. The driver is seen calling the police, and some officers are visible nearby. But the cops do not appear to intervene. Farley also caught a crowd of protesters swarming a silver Lexus that was trying to turn right as demonstrators marched in that direction. 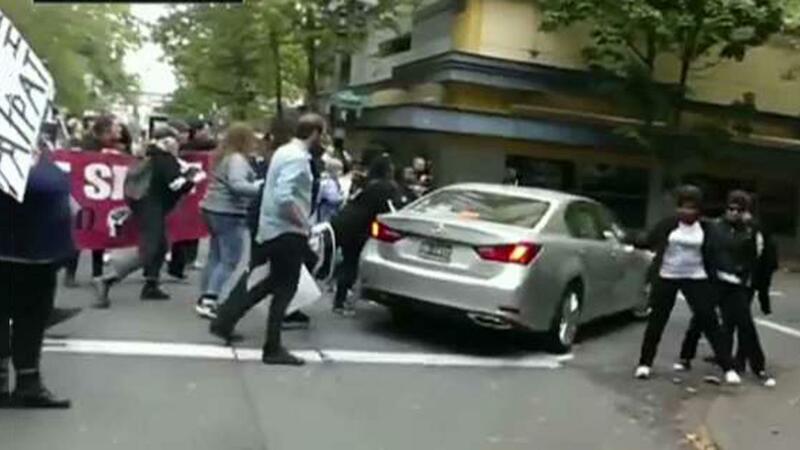 Protesters begin banging on the vehicle, and someone moves in front of the Lexus to block it as the car attempts to drive away. The driver is eventually able to get away from the group and he quickly drives away, but stops less than a block away to get a look at the damage to his car. Protesters quickly surround the vehicle again, slamming their fists against the metal frame. The driver, who did not want to be identified, told KOIN he had gotten out of his car earlier asking the protesters to move, but they allegedly grabbed him. When he got in his car, protesters started hitting it. The driver’s side window was smashed in the fracas. The man filed a police report after leaving the area. Yet another video shows an unidentified senior citizen in a wheelchair being harassed by protesters after allegedly asking one of them to stop using a megaphone outside her apartment building. A police cruiser and an officer are visible in the background but cops are never seen intervening. After several minutes of yelling, the group disperses. The elderly woman is heard telling a man trying to help her: “There is no discussion left in our country. There is only, &apos;I can outshout you.&apos; And his version is, &apos;I get a blow horn and I can outshout you.&apos;"
Andy Ngo, a journalist and Portland resident who shared the footage, told Fox News&apos; "Tucker Carlson Tonight" that police in Portland seem to take a hands-off approach to protestors. “What you saw on Saturday was that demonstrators were allowed to take over a street in downtown Portland and direct traffic and threaten drivers – stop traffic while police looked on from a block away because they were afraid of inflaming the situation,” he said. He added: “Throughout this event, the police bureau was monitoring the crowd." There were no reported arrests after the Saturday protests. A spokesman for the Portland Police Bureau and the office of Mayor Ted Wheeler did not immediately return Fox News’ request for comment. This is not the first time Antifa protests have turned violent in Portland. In early August, 38-year-old Paul Welch was left bloodied after he was attacked by militant Antifa members who were protesting a right-wing rally. Welch, a registered Democrat who supported Bernie Sanders, told The Oregonian/Oregon Live that he was brutally assaulted because he possessed a “fascist symbol” – an American flag. “The right, and certainly a lot of smaller groups like Patriot Prayer, might rush to things like the flag and try to take it up as ‘This is our symbol exclusively,’” Welch told the newspaper. “Part of my thinking was to take it back. Video of the incident, which has been viewed thousands of times, shows the person with the weapon walking away. But another counter-protester, holding a shield, moves in, stands above Welch and then jabs him with a makeshift weapon. At least three people were hospitalized after clashes between right-wing demonstrators and Antifa protestors. Anger after the fact was largely directed at Portland police, who used “less-lethal” riot-control weapons.